Another Year, Another Black-Eyed Pea. 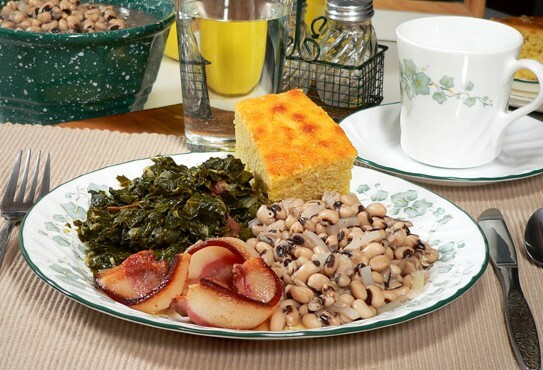 For longer than I care to admit, I’ve started each year enjoying a typical Southern style New Year’s Day meal—baked ham, collard greens, cornbread, boiled new potatoes, and of course, black-eyed peas. In fact, to the best of my recollection, it’s about the only day of the year that I eat these black spotted legumes. Not that I don’t like black-eyed peas, it’s just I never think about having them until another new year rolls around. While the black-eyed pea (they’re actually a bean, not a pea) was likely first domesticated in West Africa, it also has history in many Asian countries where it has been widely grown for thousands of years. Black-eyed peas were introduced to America by colonists of Virginia during the 17th century, although its cultivation as a food crop in that region did not become popular until after the American Revolution. Today this heat-loving, drought and disease tolerant crop is grown throughout the American South, including Texas, and is used in traditional soul food dishes such as “Hoppin’ John” and “Texas Caviar.” Of course, probably the most popular method of preparing black-eyed peas is boiling them in a big pot seasoned with pork jowls or fatback. Just how these legumes became one of the New Year’s Day good-luck foods can be associated with any of several legends. I’m sure you have all heard the claim that the black-eyed pea is representative of coins, which may have come from an old Southern saying “peas for pennies, greens for dollars, and cornbread for gold,” because they certainly do not look any coins I’ve ever seen. The superstition is that in order for them to actually bring you luck, you must eat exactly 365 peas on New Year’s Day—no more, no less. Then there’s the thought that since these peas swell when cooked, they represent increased prosperity in the new year. Another reason black-eyed peas may have become a good luck symbol in the American South dates back to the Civil War. History tells us that Union troops typically plundered or destroyed all of the South’s food supplies when taking an area. 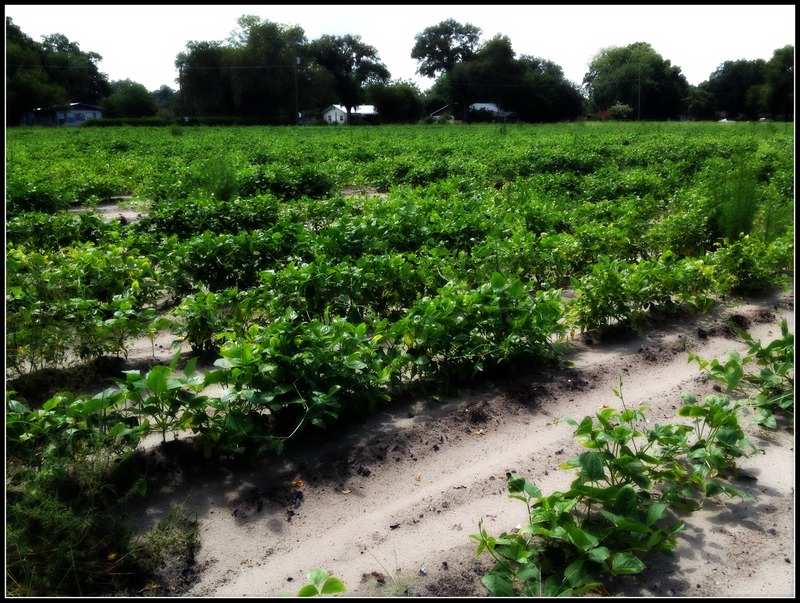 But since Northerners at the time considered black-eyed peas fit only for livestock fodder, they spared this humble food. It therefore became a much needed Southern sustenance and symbol of good luck. 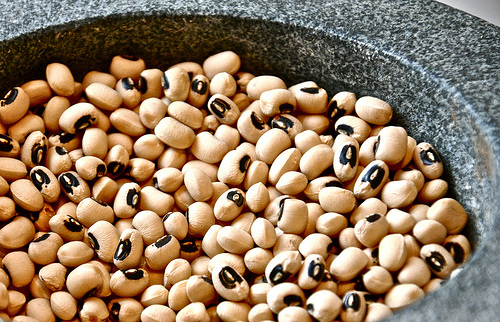 A popular variation to this story is that on January 1, 1863—the day the Emancipation Proclamation became effective—black-eyed peas were one of the only foods southern slaves had available with which to celebrate. So from that day forward, peas were always eaten on New Year’s Day. 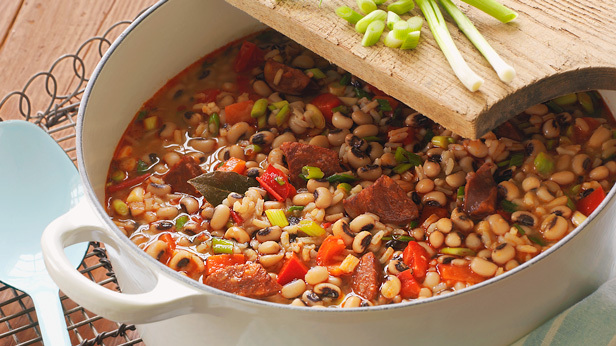 The good-luck traditions of eating black-eyed peas for New Year’s are not limited to the Southerners in this country. According to the Babylonian Talmud (339 CE) they are an established good luck symbol associated with Rosh Hashanah, the Jewish New Year. And although they being a part of this list may be the result of an early mistranslation of the Aramaic word rubiya, consuming them along with long melons, leeks, beets, spinach, and dates is a custom still followed by Sephardi and Israeli Jews. There are even those who claim it was Sephardic Jewish colonists that settled in Georgia in 1733 who introduced this custom to the American South. So the question remains. Does making black-eyed peas part of your New Year’s Day celebration really ensure prosperity for the coming year? In answer to that question I would like to divulge one of my life experiences. Some thirty years ago after meeting my lovely bride, I decided to introduce her and her family of Italian restaurateurs to a traditional Southern New Year’s Day meal. And if that alone were not enough, we ate the meal in the main dining room of their Brooklyn Italian restaurant during the middle of the afternoon while the place was open. Can you picture customers coming in to enjoy a plate of Veal Marsala or Chicken Cacciatore and finding the family, waiters and cooks eating black-eyed peas, collard greens (which a friend had to pick up in Harlem), ham, and cornbread? Along with a good laugh, some of my father-in-laws loyal customers even asked if they could try some of the humble but delicious Southern fare we were eating. That year my wife’s family enjoyed one of the most profitable years in the restaurant’s sixty-year history. So much so that they were able to purchase a building in the neighborhood in which to expand their business. As for me personally? I became a part of the nicest family I’ve ever known. We now have two wonderful sons, three grandchildren, and I’ve continued to enjoy career growth and prosperity every year since. Maybe our good fortune is the result of that New Year’s Day meal—perhaps not. But I certainly intend to continue enjoying black-eyed peas as part of my annual New Year’s tradition and anticipating all the blessings eating them brings. Make Em: Texas Caviar, Hoppin John, Black-Eyed Pea Cakes. This entry was posted in Uncategorized and tagged Civil War, good luck foods, New Year's Day, slavery, the south by grubamericana. Bookmark the permalink.